Ancient Roman society was a class and status conscious society which meant that in the everyday life of the people, social status was reflected and this was true for the clothing of ancient Rome too. There was a marked difference between the clothing of the common people and that of the upper classes, and it not only differed in styles but also was fashioned from different materials. There was also a difference between the clothing of young people and the adults of Rome. Additionally, special kinds of clothing were reserved for religious ceremonies and other special occasions which held high importance in this ancient society. In ancient Rome various fashions and styles were used along with clothing, particularly by people from the upper classes. While the main garment of clothing remained more or less the same for different people, it differed in various other aspects such as colour, style, fabric, texture, weight and fit. Women could sow different patterns into their dresses. For instance, one fashion was called the gap-sleeved tunic where bottoms of the sleeve were stitched and the tops were tied at intervals. Women also styled their hair in various ways and mostly had long hair. The famed Roman tunic, worn by people of all classes and the common piece of Roman clothing. Various accessories were often used, particularly by the people of the upper classes. For instance, a lot of people used cloaks with the main tunic and these cloaks varied in style and material. These cloaks could be long trailing on the floor or could go up to the knees. Just like different toga styles were reserved for people of different classes, the cloaks reflected the social status of Roman people. Both males and females used a form of underwear which was a simple loincloth called the ‘subligaculum’. Similarly, there was not much distinction between the footwear of men and women. The most common form was sandals tied around the ankle with thin strips of leather. While clothing in Rome for men was mostly white in colour, women usually wore clothes in different colours. The mostly commonly used female dress was called a stola which was a long tunic reaching to the ground. Another tunic was used under the stola and was known as a tunica interior. The stola was usually kept shorter in length so as to show the layers of garments, thus representing the social status. Women of upper classes often also used a wide ornamental border known as instita on the lower hem of the tunic or the stola. A common over-garment used by women was called palla which was similar to a man’s toga. The most important components of clothing for men was the tunic and the toga. The Tunic was the most commonly used clothing item in ancient Rome for men and was the only article of clothing for many men of the lower classes and slaves. The Tunic reached to the knees and there were marked differences between the tunics of the rich and poor people. Tunic with purple stripes was reserved for the senators. 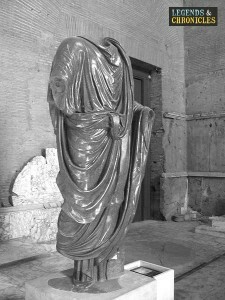 The other important article of historic Roman clothing for men was a toga which was reserved for the free Roman citizens. It was a large cloth draped around the body with one arm free. There were some differences in the ancient Roman clothing for men and children. The toga worn by children was called a ‘Toga praetexta’, which was an ordinary white tunic with one purple stripe on its shoulder. However, the purple stripe was only reserved for free boys and could not be worn by the slaves. Girls also used simple tunics with woollen belts around their waists. Clothing for children in ancient Rome also consisted of a special charm called a ‘bulla’ which was worn around the neck. 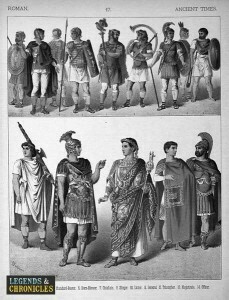 A selection of Roman clothing examples. Dressing was one of the most important parts of Roman life since it was a direct indication of social standing. The clothing for the elite differed from the clothing of the ordinary people in terms of style as well as material. For instance, the togas and tunics of the common people were generally made of coarse, dark materials while the clothes for the elites was made of fine materials such as wool. Specific kinds of togas were reserved for important people. For instance, politicians wore bleached togas while purple togas with gold embroidery were often worn by victorious generals and even the emperors. Special kinds of clothes was reserved for military personnel, for example, while the uniform was not highly standardised and there were variations in different places, the general code was more or less the same. The most basic article of Roman style clothing for the soldiers was a tunic made of red or off-white wool. Additionally, white cloaks and plumes were reserved for the senior commanders. 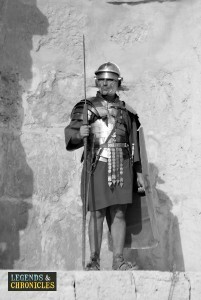 Other important components of ancient Roman clothing for the soldiers included the soldier’s helmet known as a Galea, a belt worn over one shoulder known as a baldric, and heavy-soled military shoes were worn on the feet. A Roman soldier dressed in typical clothing, a tunic and armour. Peasants and salves were at the lowest rungs of the Roman society and thus social inferiority was also reflected in their dress. The dressing of the salves doing manual jobs such as mining differed from the dressing of relatively well off slaves who were educated and did respectable jobs. The clothing for slaves involved in manual work was often just a loincloth while some working in agriculture received a tunic and a cloak along with a pair of wooden shoes every two years. Better clothing was reserved for the slaves of well of people since it reflected the social standing of their masters. Ancient Roman clothing was inspired in part by Greek clothing but also had its own independent and distinctive features. It was customary for clothing to also depict where you stood in the Roman social scale, as with many civilisations, the higher status people typically dressed better.